Rick Smith had never met David Pontious before he agreed to welcome the man aboard his sailboat, Cimarron, in October 2015. Smith, a Camden resident, was piloting the 43-foot vessel from Maine to the warm waters of the U.S. Virgin Islands for winter. Pontious didn’t join until North Carolina, when Smith replaced another crew member who had to depart. That’s when things took a bizarre turn. Four days of increasingly erratic behavior by Pontious culminated in a violent standoff between him and Smith in the early-morning hours. The boat was more than 300 miles from land. Pontious ended up jumping over the port side into the blackness below. Lost at sea. Presumed dead at age 54. It’s not clear why prosecutors took so long to bring charges. The U.S. Attorney’s Office in the Virgin Islands, where the case resides, would not comment. In documents, though, the government has alleged that Smith failed in a number of areas to ensure Pontious’ safety and to properly report the incident in a timely manner. Several maritime attorneys in Maine agreed that charging a captain in such an incident is highly unusual. Although boat captains assume responsibility for virtually everything that happens aboard their ships, that often matters more on commercial vessels or in cases where negligence is clear, such as the case of a lobster boat captain from the midcoast who pleaded guilty this year to two counts of seaman’s manslaughter after two crew members died when their boat sank. That captain was under the influence of drugs and alcohol at the time. Smith’s loved ones can’t fathom why an experienced, respected sailboat captain should be held responsible for the actions of Pontious, who appeared to be troubled before he boarded the Cimarron and grew steadily worse. Smith, 66, is under house arrest in the Virgin Islands while he awaits trial. The boat he’s owned and sailed for half his life is impounded. He faces up to 10 years in prison. Reached by phone last month, Smith was reluctant to speak until the legal case has been resolved but said he’s no criminal. “Nothing close to this has ever happened to me,” he said. The following account was built from investigative reports, court documents and interviews with maritime experts and people who know Smith. 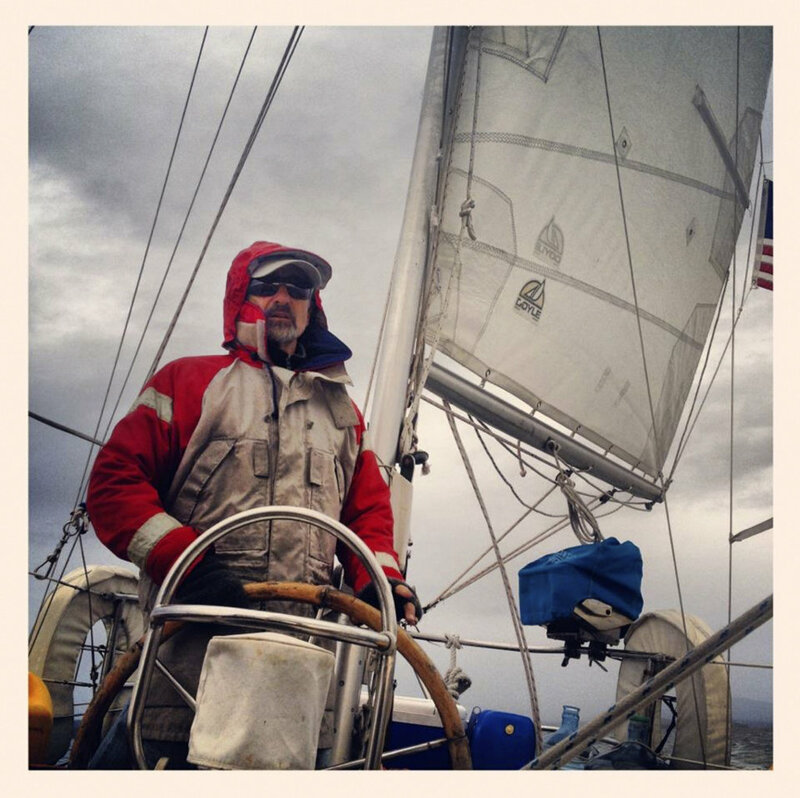 Smith, who grew up in Portland, has been sailing much of his life. He bought the Cimarron in the early 1980s when the couple was still married. The Cimarron is a yawl, the term for a two-masted sailing vessel whose mainmast is taller than the mizzen mast. The boat was actually a contributing factor in the end of their marriage, Dehlinger said. “I wanted a home with roots,” she said. The couple have remained on good terms since their divorce and have raised a son, Holland, who lives in California, and a daughter, Ashley, who lives in Massachusetts. For the past decade, Smith has been dividing his time between Camden and the Virgin Islands, offering day cruises and private charters out of both locations. Every October, after the season ends in Maine, he sails the Cimarron south. The 2015 voyage started out no different from any other. Three crew members joined him in Maine. Jacob Pepper and Heather Morningstar were both from the Virgin Islands and were heading home. They had each sailed with Smith before. The other was Candace Martin, an old friend of the captain’s. Martin, who owns an art gallery in Charleston, South Carolina, could only sail for 10 days. So she arranged to get dropped off in North Carolina. Someone there would take her place: David Pontious. No one on board the Cimarron knew Pontious, although Martin knew his father, Frank Pontious, who is well-connected in the sailing scene in Beaufort, North Carolina. Martin did not return a message seeking comment. Tom Larson, who operates a commercial sailboat out of the Virgin Islands and knows Smith, said it’s not uncommon for captains to find crew members on short notice. He said he has picked up crew members on a dock hours before a trip. David Pontious appeared to be experienced. A story published in October 2015 in the Beaufort Gazette said he attended seamanship school in Florida, taught sailing lessons out of San Francisco and was a U.S. Merchant Marine officer for a time. He was also a member of the Beaufort Yacht and Sailing Club, officiated races and had a day job in health care technology. Smith, Morningstar and Pepper would later tell a Coast Guard investigator that Pontious appeared out of shape when he first boarded the boat around 11 p.m. on Oct. 21. His feet were so swollen that they wouldn’t fit in his shoes. The four slept that night while the Cimarron was docked in Beaufort and set sail the next morning at about 9. After an hour or so on the water, Pontious became seasick. The other crew members offered him a patch for motion sickness to put behind his ear, but he refused. That day he spent lying down and throwing up. When he did walk around the boat, he was wobbly. Strange for someone with many sailing hours logged. The next day, Pontious relented and accepted the transdermal patch, but it didn’t seem to help. He couldn’t keep any food down. The crew assumed that Pontious was still sick and dehydrated, so they encouraged him to keep trying to eat and drink. The next day, Pontious’ hallucinations seem to get stronger. He told the others that he heard voices in the boat’s forecastle, where he had slept, and didn’t want to stay there anymore. When he wasn’t lying down, Pontious was pacing back and forth on the deck, which is about the size of an average living room but elongated. That evening, around 9 p.m., Pontious asked Pepper, who was manning the boat, where they were going. Pepper told him, “St. John,” which confused him. Pontious said he didn’t think he was on the same boat as when he left North Carolina. Smith asked Pontious if he was on any drugs. Pontious said he was taking heart medications. Investigators, though, later found more pills, including a silver key fob that contained an unidentified pill and 13 others that were Trazadone, an antidepressant used to treat insomnia, anxiety and major depressive disorders. He also was taking a drug called doxycycline to treat a skin condition, rosacea. Patients who use that medication are advised to avoid the sun. It wasn’t clear which pills he had been taking because his body has not been recovered. Pontious’ father later told investigators that his son had suffered from depression in the past. The crew tried to keep Pontious calm. Then another hallucination came. He saw a door in a cloud. He was yelling. Smith asked him what was behind the door. “There is a portal behind the door and there are computers and electronic equipment that I can use to get me out of this auditorium,” he said. Smith, Pepper and Morningstar grew frightened. Pontious didn’t calm down. He tried to take the helm and steer the boat toward the cloud with the door. He grabbed the boat’s VHF radio transmitter and started yelling “Help.” Smith explained to him that the Cimarron was too far out at sea for the radio. Then Pontious, who stood 6 feet and weighed at least 250 pounds, grabbed Smith by the shoulders and started to shake him. He punched him twice and then started to choke him. But Smith had a small opening. He turned the boat suddenly starboard, which knocked Pontious off his feet. Pontious got back up and stared down Smith, who was still standing at the helm. He then climbed up and over the wiring railing and leaped off the port side of the boat. His head hit the railing on the way down. Smith said he watched Pontious sink. The water was lit well by a nearly full moon. The wind was at 5 knots, which is calm. Smith asked Pepper to shine the spotlight down. They saw nothing. “There is nothing we can do,” Smith said. Pepper and Morningstar were both shaking with fear. Smith grabbed the VHF radio to try to contact other vessels. Only static. Morningstar asked Smith if they should turn the boat around. Smith did not. Larson, the captain who also charters sailboats out of St. John and has known Smith for 10 years, said he’s not sure he would have done anything different. “You can’t just turn a boat like that around in the middle of the ocean,” Larson said. It wasn’t until morning that Smith was able to contact Chris Parker, a forecaster with the Florida-based Marine Weather Center who had been providing the Cimarron with weather reports. Smith told Parker to contact the Coast Guard. The Coast Guard dispatched a crew to the area, including a C-130, a massive plane used for surveillance. Investigators also learned that at some point before the Cimarron arrived in the Virgin Islands, Smith dumped overboard two items: an unlicensed firearm and a bag of marijuana. Prosecutors referenced both in court documents. Sheesley, Smith’s attorney, said the government calling the gun “unlicensed” has no significance and Smith committed no crime. As for the marijuana, Sheesley said it belonged to Pepper. He didn’t explain, though, why Smith got rid of them. Neither Pepper nor Morningstar returned messages requesting comment. Smith cooperated with Coast Guard investigators immediately. So did Pepper and Morningstar. Those three interviews formed the basis of an investigative summary written by Lt. Jacob Hopper of the Coast Guard. That summary was dated Nov. 4, 2015. In February 2017, Smith was extended an invitation to testify before a federal grand jury about possible criminal charges in connection with Pontious’ death. “While the invitation extended in your letter for Mr. Smith to waive his constitutional rights and testify under oath, without an attorney present, in order to charge him with crimes is tempting, we will politely decline to do so at this point,” Sheesley wrote in a letter dated March 6. They met with a prosecutor a week later and even were presented with a plea agreement, even though Smith hadn’t been charged. Again, he declined. It wasn’t until late spring or early summer of 2018 that a grand jury returned a one-count indictment charging Smith with seaman’s manslaughter. The indictment was sealed. Smith didn’t find out until Coast Guard officials arrested him Nov. 2 as he brought the Cimarron into St. John. He was released from jail three days later on a $25,000 bond but was ordered to house arrest after prosecutors deemed him a flight risk. The legal case could prove fascinating. Sheesley has filed a flurry of motions — to dismiss the case, to change the venue to Maine. He has argued that Smith was the victim of vindictive prosecution for failing to appear before a grand jury. Mostly, though, Sheesley said the government seems to be ignoring the Coast Guard investigative report, which he believes exonerates Smith. The government disagrees, arguing that had the captain deployed the boat’s emergency beacon, the Coast Guard would have been immediately alerted of the need to begin a search-and-rescue mission. “Defendant Smith made the deliberate choice not to avail himself of any of these safety measures,” prosecutors wrote. Sandy Welte, a Camden lawyer who specializes in maritime law, said his reading of the statute is that the burden of proof on prosecutors may not be as great as in, say, a case of negligence resulting in death on land. Smith also was served with a lawsuit, filed by Pontious’ family, on Oct. 22, two weeks before his arrest. That suit has since been dismissed, although the family could always pursue a case again after the criminal case is resolved. Neither Gregory Hodges, an attorney for the Pontious family, nor Frank Pontious, David’s father, would comment on the case. Johnna Dehlinger, Smith’s ex-wife, said even though the case against Smith seems thin, she’s fearful he could end up in jail. She also worries that, even if he is found not guilty, the incident in October 2015 may have forever changed him.